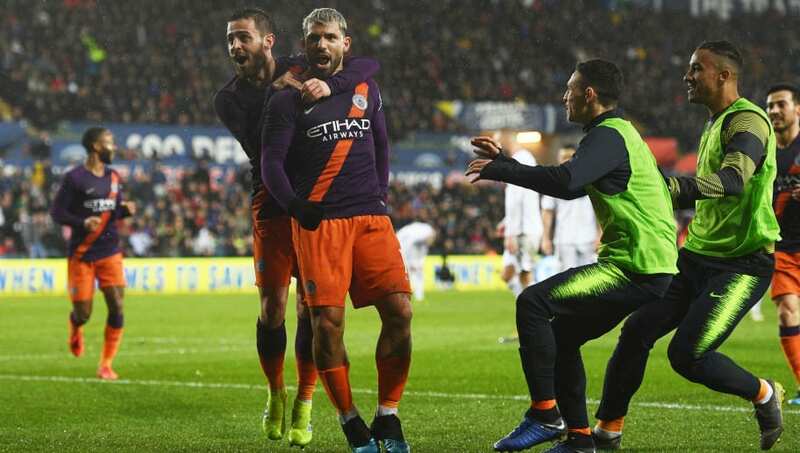 Manchester City came from 2-0 down to progress to the FA Cup semi-finals, as they beat Swansea City 3-2 on Saturday evening. Swansea took a shock lead after 20 minutes, as Fabian Delph's foul on Connor Roberts resulted in a penalty. Matt Grimes stepped up and sent Ederson the wrong way, as the Swans struck first against the Premier League champions. The Championship side doubled their lead nine minutes later, as Bersant Celina finished off a nicely worked team goal with a curling finish. It was a remarkable goal for more than one reason, with the 22-year-old having left Manchester City in 2018 after six years with the club. Manchester City pulled one back in the 69th minute thanks to a spectacular finish from Bernardo Silva. The Portuguese man picked the ball up inside the box, and powerfully struck the ball with the outside of his foot to get the Citizens back into the game. City drew level through a penalty in the 77nd minute, as Raheem Sterling was judged to have been brought down - with no VAR to review the dubious decision. Substitute Sergio Aguero stepped up, as his shot hit the post and went in off the back of goalkeeper Kristoffer Nordfeldt. Aguero scored the winner two minutes from time, albeit from an offside position, heading home Bernardo Silva's cross to complete City's fantastic comeback. The Citizens now progress to the FA Cup semi-finals, reaching that stage for the second time in three years. ​Swansea City needed to produce a miracle to defeat the Premier League champions, and it looked like it was going to happen as they took a two-goal lead inside 30 minutes. They were resilient in defence and ruthless in attack, and played very well. However it wasn't meant to be for Graham Potter's side, as three goals in a 20-minute spell cost Swansea on what could've been a historic night. They played with heart and spirit all throughout the game, but it wasn't enough as they respectfully bowed out in the quarter-finals. Starting XI: Nordfelt (8); Carter-Vickers (7), Grimes (7), Van der Hoorn (6), Roberts (6); Byers (7), Fulton (6), Celina (8*); Routledge (6), James (7), Dyer (6). Substitutes: Asoro (6, John (6), Harries (N/A). STAR MAN - While Swansea couldn't beat the English champions, Bersant Celina had an excellent game. He scored the Swans' second goal of the evening and was brilliant throughout the game, though he was unlucky to not end up on the winning side. Manchester City were determined to continue their pursuit of a historic quadruple, and for the majority of the game they looked to be going out of the FA Cup. They were on the back foot for 70 minutes, despite Pep Guardiola fielding a very strong side. However, City showed exactly why they are the reigning ​Premier League champions - and pulled off a stunning comeback inside the last 20 minutes to progress to the last four. It was a champions' performance in south Wales, as City march on to Wembley. They were, however, aided by the lack of VAR at the Liberty Stadium - with Sterling's penalty award, and Aguero's winner, likely to have been chalked off had the referee had an opportunity to review both decisions. Starting XI: Ederson (6); Delph (5), Laporte (6), Otamendi (6), Walker (7); Gundogan (6), D.Silva (6), B.Silva (8); Sane (6), Jesus (5), Mahrez (6). Substitutes: Zinchenko (6), Sterling (6), Aguero (8*). AGGGUUUUUERRRROOOOOOO!!!! WOULDN'T YOU JUST KNOW IT!! STAR MAN - Brought off the bench in the 64th minute and scoring the winner in the 88th, ​Sergio Aguero was outstanding. Though ​Bernardo Silva deserves some credit, it was Aguero's last gasp contribution that sent Manchester City through. The international break gives both sides two weeks off, before they are return to action in their respective leagues. Swansea face a trip to City Ground to face ​Nottingham Forest on 30 March, before welcoming ​Brentford to the Liberty Stadium three days later. Manchester City are in London next, when they play ​Fulham at Craven Cottage on 30 March. They then return to the Etihad the following Saturday, as they host relegation battlers ​Cardiff City on 6 April. City will play their semi-final tie at Wembley Stadium on 6/7 April, with the date to be confirmed in due course. They will find out their opponents on Sunday afternoon, with the draw being made following the final quarter-final tie between ​Millwall and ​Brighton.